William H. Richardson Financial Advisor Buffalo, NY William H. Richardson – Trubee, Collins & Co., Inc.
William H. Richardson has worked for fifty-two years in the financial services industry at Trubee, Collins & Co., Inc.
As a Registered Investment Advisor, he has also served the Firm in managerial capacities — having previously served as Co-Chairman of the Board and President/Managing Partner for twenty-four years. In addition to being on the Board of Directors with Trubee, Collins, Bill also served a three-year term on the Board of Governors for F.I.N.R.A. (formerly known as the N.A.S.D.) and on the arbitration panel for the N.A.S.D. Additionally, Bill holds the following licenses: General Securities — Series 7, General Securities Principal — Series 24, Financial and Operations Principal — Series 27, Municipal Securities Principal — Series 53, Uniform State — Series 63, and Investment Advisor — Series 65. 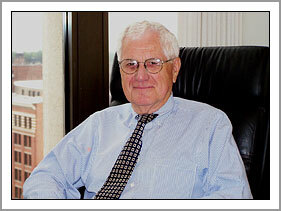 A graduate of St. Lawrence University, Bill served two years in the U.S. Army before joining the Firm in the Fall of 1958. Bill is a long-term resident of Hamburg and remains active playing golf and tennis.